Saturday is the day: we are running the Beach to Beacon! Because it's the largest road race in the State of Maine - there's quite a bit involved with this race. Not only for the organizers but for the runners too. We can't just show up 15 minutes prior to the start of the race at all. This will be our (mine and Ward's) third year running this race and I think we have a plan in place. The first year we ran the race, Ward and I were stuck on the Casco Bay Bridge for at least 45 minutes. I remember being so panicked about making the race AND having to pee so bad. We parked at the high school just as the VERY LAST shuttle bus came through and we had to sprint to the bus to make it. Our warm up consisted of the sprint to the bus and the run from the bus to the starting area. Since we got there so late, we could not "self seed" - and were stuck in the 9:45 pace. Okay pace for me at the time, not an okay pace for Ward. The start is also mad crazy. The first year, it took me at least 4 minutes to get to the starting line after the gun went off. After the race, it took me forever to find Ward. Ward and I (and my brother-in-law, Wade) dropped the kids off way earlier at my in-laws house and flew down the high way. The directors had added a new satellite parking option that did not involve the bridge - so that is where we parked. SOOOO much better! We got to the starting area with plenty of time. We found our friends Mark and Christine. We had tons of time to warm-up, stretch, use the port-a-potties before the line was a mile long, and self-seed. We even had a meeting place arranged and it worked! We were able to find each other super easy this time around. The only thing that we really needed to improve upon was NOT getting the kids up so earlier. SO, the plan for this year is this: my mother-in-law is going to sleep at Wade and Jill's house (because Wade and Jill are running the race as well!) Friday night. One of us may sleep over there with our kids and one will stay at home with the dogs - trust me, this may be easier. We will leave Wade and Jill's house no later than 5:45, pick Stacy up in Richmond and we'll be off! This should land us at the satellite parking by 6:45 again allowing plenty of time for peeing, stretching, checking bags, and warming up! 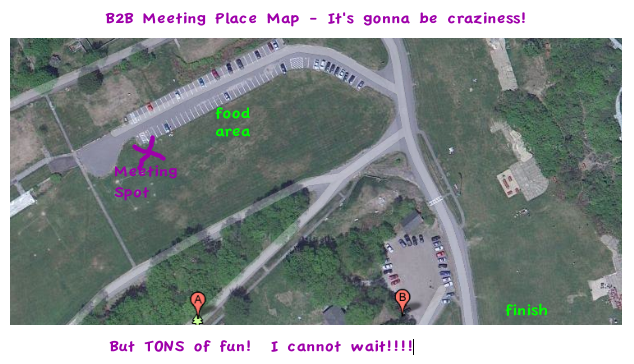 I even made out a map to share with the group about our meeting spot! Mark and Christine - please meet us here. Actually, Christine - my goal will be to keep up with you again this year, so I'll just follow you to the meeting spot. Okay? Maybe my new blogging friends will meet me there too? I'd love to see Emilie, Jenn, Carrie, and Sarah there! (Danielle - are you running?) Did I miss any other bloggers? YES i will be there! and since youll be meeting up with mark and christine, and mark is completely impossibly NOT to find, you and i will meet. win! Thanks for the map! I'll be looking for you guys! Good luck!